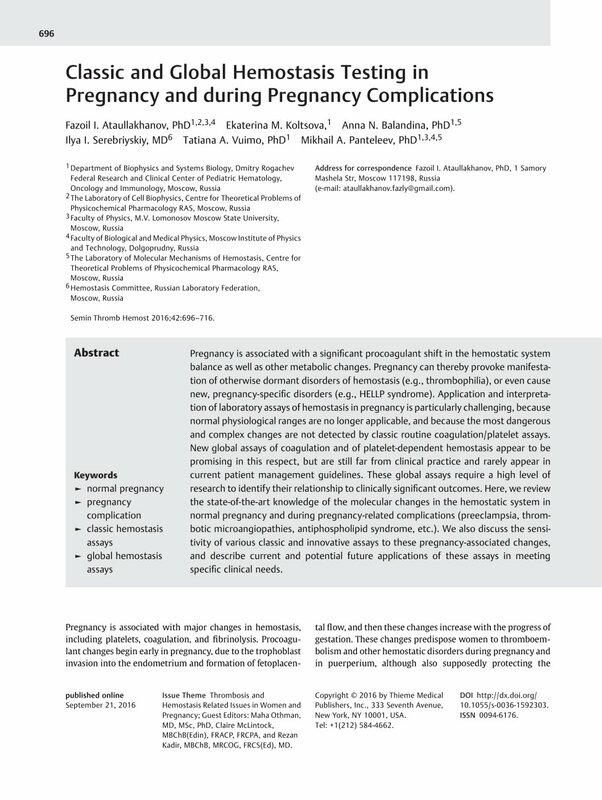 Pregnancy is associated with a significant procoagulant shift in the hemostatic system balance as well as other metabolic changes. Pregnancy can thereby provoke manifestation of otherwise dormant disorders of hemostasis (e.g., thrombophilia), or even cause new, pregnancy-specific disorders (e.g., HELLP syndrome). Application and interpretation of laboratory assays of hemostasis in pregnancy is particularly challenging, because normal physiological ranges are no longer applicable, and because the most dangerous and complex changes are not detected by classic routine coagulation/platelet assays. New global assays of coagulation and of platelet-dependent hemostasis appear to be promising in this respect, but are still far from clinical practice and rarely appear in current patient management guidelines. These global assays require a high level of research to identify their relationship to clinically significant outcomes. Here, we review the state-of-the-art knowledge of the molecular changes in the hemostatic system in normal pregnancy and during pregnancy-related complications (preeclampsia, thrombotic microangiopathies, antiphospholipid syndrome, etc.). We also discuss the sensitivity of various classic and innovative assays to these pregnancy-associated changes, and describe current and potential future applications of these assays in meeting specific clinical needs.